Definition at line 38 of file llurlwhitelist.h. Definition at line 62 of file llurlwhitelist.h. Definition at line 53 of file llurlwhitelist.cpp. Definition at line 43 of file llurlwhitelist.cpp. Definition at line 177 of file llurlwhitelist.cpp. References mUrlList, save(), and url_cleanup(). Definition at line 69 of file llurlwhitelist.cpp. Definition at line 143 of file llurlwhitelist.cpp. Definition at line 217 of file llurlwhitelist.cpp. Definition at line 192 of file llurlwhitelist.cpp. Definition at line 75 of file llurlwhitelist.cpp. Definition at line 205 of file llurlwhitelist.cpp. Definition at line 60 of file llurlwhitelist.cpp. Definition at line 82 of file llurlwhitelist.cpp. References addItem(), clear(), gDirUtilp, LLDir::getExpandedFilename(), LL_PATH_PER_SL_ACCOUNT, llifstream, mFilename, and mLoaded. Definition at line 118 of file llurlwhitelist.cpp. 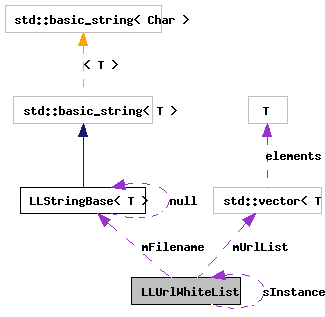 References gDirUtilp, LLDir::getExpandedFilename(), LL_PATH_PER_SL_ACCOUNT, llofstream, mFilename, and mUrlList. Definition at line 67 of file llurlwhitelist.h. Referenced by clear(), getFirst(), and getNext(). Definition at line 65 of file llurlwhitelist.h. Definition at line 64 of file llurlwhitelist.h. Definition at line 66 of file llurlwhitelist.h. Referenced by addItem(), clear(), getFirst(), getNext(), and save(). Definition at line 60 of file llurlwhitelist.h. Referenced by cleanupClass(), getInstance(), and initClass().